I am currently in the process of migrating the content shared here to a series of new websites hosted at shirleytwofeathers.com. As you explore this site, you may find links to a "page not found" instead of something cool and magickal. For this I apologize. I am very working hard behind the scenes to restore those pages along with a link to their homes on my new website where they can be viewed in full. 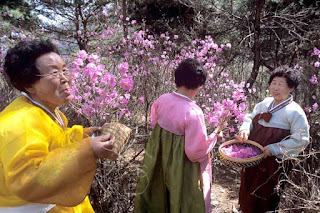 Samjinnal is the festive day that informs the arrival of spring. This day is known as the day the swallows came back from Gangnam and the day the snake came out from its winter sleep. It is also the day birds and butterflies start to appear. The author of this site is not doctor or medical certified professional, the information on herbal remedies presented here is for informational purposes only and should not be taken as medical advice. Ask any yes or no question, and Auntie Moss be givin' you an answer. This old witch woman is wiser than you think. Go ahead, give it a go.